With over 200 venues offering rock, blues, jazz, hip hop, punk or Latino shows nightly, Austin is known for its live music. Downtown Austin also includes a vibrant shopping, dining and entertainment scene. The famous 6th Street Entertainment District, Warehouse District and 2nd Street District are all located within walking distance of the Austin Hilton Hotel and the Austin Convention Center, and Bergstrom International Airport is just seven miles away. Serving up tunes since 1978, Maggie Mae’s is a local legend in Austin with the largest rooftop view on 6th Street and the entertainment district. 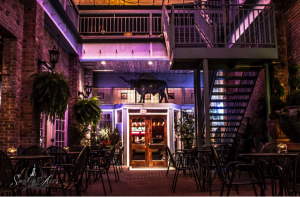 This is the perfect location for the Welcome Reception with live music featuring the Eric Tessmer Band and chef-inspired dishes. 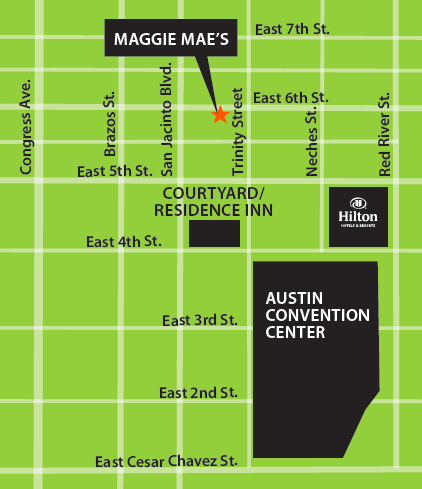 Within walking distance from the Hilton Austin Hotel, join us at Maggie Mae’s on Friday, April 21 from 6:30 – 8:30 pm, located at 323 East 6th Street. The VIP Reception (by invite only) will also be held at Maggie Mae’s starting at 5:30 pm. Please remember to bring your expo badge as your entry ticket into the venue. There will also be a registration desk at the entry doors to Maggie Mae’s where you can also pick up a badge if you have not registered. Towering with 31 floors, the Hilton Austin Hotel offers views of the city and Lady Bird Lake. Many Austin attractions are minutes from the hotel including the Texas State Capitol Building, the Bob Bullock Texas State History Museum, and the LBJ Library.